« If Gun Control Works in Europe, Where Do Terrorists Get their Weapons? Why Doesn’t Hillary Learn any Lessons from the Slow Suicide of California and other High-Tax States? Here’s a quiz for readers. d) Out-migration of productive taxpayers? g) A bigger underground economy? This is a trick question because the answer is (j), all of the above. But let’s look at some of the evidence for (d), which deals with the fact that the geese with the golden eggs sometimes choose to fly away when they’re mistreated. The Internal Revenue Service has a web page where you can look at how many taxpayers have left or entered a state, as well as where they went or where they came from. And the recently updated results unsurprisingly show that taxpayers migrate from high-tax states to low-tax states. Let’s look at some examples, beginning with Maryland. Here are some excerpts from a report in the Daily Caller. Wealthy taxpayers and job-creating businesses fled Maryland at an accelerating rate as then-Gov. Martin O’Malley implemented a long list of tax hikes during his first five years in the state capital. More than 18,600 tax filers left Maryland with $4.2 billion in adjusted gross income from 2007 – O’Malley’s first year as governor — through 2012, according to a Daily Caller News Foundation analysis of the most recently available Internal Revenue Service state-level income and migration data. …Nearly 5,600 state-tax filers left Maryland in 2012 and took $1.6 billion with them, more than double the 2,300 who departed with $732 million in 2011. The fleeing 5,600 filers had average incomes of nearly $291,900. …Most of 2012’s departing residents moved to the more business-friendly Virginia, according to the data. …Florida was the third most common destination for Marylanders. Here’s a chart looking at the income that moved into the state (green) compared to the much greater amount of income that left the state (red). The story then makes a political observation. O’Malley’s economic record may partially explain why his campaign for the 2016 Democratic presidential nomination has yet to gain traction among voters outside of Maryland. Though I wonder whether this assertion is true. Given the popularity of Bernie Sanders, I can’t imagine many Democrat voters object to politicians who impose foolish tax policies. Now let’s shift to California. A column in the Sacramento Bee (h/t: Kevin Williamson) explores the same IRS data and doesn’t reach happy conclusions. An unprecedented number of Californians left for other states during the last decade, according to new tax return data from the Internal Revenue Service. 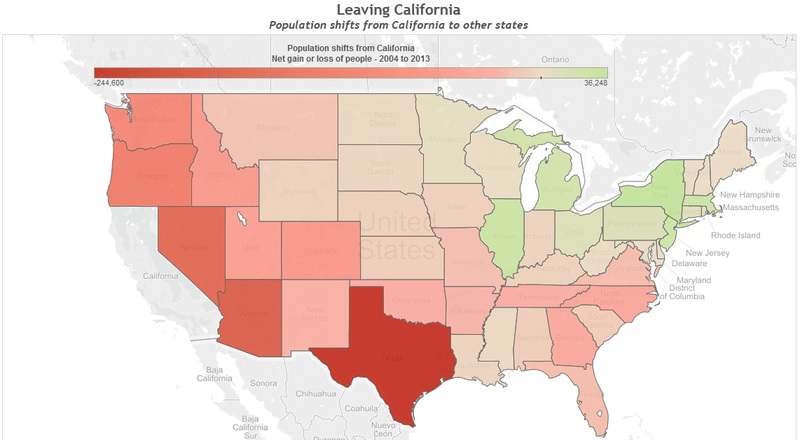 About 5 million Californians left between 2004 and 2013. Roughly 3.9 million people came here from other states during that period, for a net population loss of more than 1 million people. The trend resulted in a net loss of about $26 billion in annual income. Many of them went to zero-income tax states. About 600,000 California residents left for Texas, which drew more Californians than any other state. Here’s a map from the article and you can see other no-income tax states such as Nevada, Washington, Tennessee and Florida also enjoyed net migration from California. Last but not least, let’s look at what happened with New York. We’ll turn again to an article published by the Daily Caller. More taxpaying residents left New York than any other state in the nation, IRS migration data from 2013 shows. During that year, around 115,000 New Yorkers left the state and packed up $5.65 billion in adjusted gross income (AGI) as well. …Although Democrat Governor Andrew Cuomo acknowledged that New York is the “highest tax state in the nation” and it has “cost us dearly,” he continues to put forth policies that economically cripple New York residents and businesses. Once again, much of the shift went to state with no income taxes. New York lost most of its population in 2013 to Florida — 20,465 residents ($1.35 billion loss), New Jersey — 16,223 residents ($1.1 billion loss), Texas — 10,784 residents ($354 million loss). Though you have to wonder why anybody would move from New York to New Jersey. That’s like jumping out of the high-tax frying pan into the high-tax fire. At this point, you may be wondering why the title of this column refers to lessons for Hillary when I’m writing about state tax policy. The answer is that she wants to do for America what Jerry Brown is doing for California. Check out these passages from a column in the Wall Street Journal by Alan Reynolds, my colleague at the Cato Institute. Hillary Clinton’s most memorable economic proposal, debuted this summer, is her plan to impose a punishing 43.4% top tax rate on capital gains that are cashed in within a two-year holding period. The rate would drift down to 23.8%, but only for investors that sat on investments for six years. This is known as a “tapered” capital-gains tax, and it isn’t new. Mrs. Clinton is borrowing a page from Franklin D. Roosevelt, who trotted out this policy during the severe 1937-38 economic downturn, dubbed the Roosevelt Recession. FDR had so many bad policies that it’s difficult to pinpoint the negative impact of any specific idea. But there’s certainly some evidence that his malicious treatment of capital gains was spectacularly unsuccessful. In the 12 months between February 1937 and 1938, the Dow Jones Industrial stock average fell 41%—to 111 from 188.4. That crash presaged one of the nation’s worst recessions, from May 1937 to June 1938, with GDP falling 10% and industrial production 32%. Unemployment swelled to 19% from 14%. Harvard economist Joseph Schumpeter, in his 1939 opus “Business Cycles,” noted that “the so-called capital gains tax has been held responsible for having accentuated, if not caused, the slump.” The steep tax on short-term gains, he argued, made it hard for small or new firms to issue stock. And the surtax on undistributed profits, Schumpeter wrote, “may well have had a paralyzing influence on enterprise and investment in general.” …A 2011 study from the Federal Reserve Bank of St. Louis reported…“The 1936 tax rate increases,” they concluded, “seem more likely culprits in causing the recession.” …A 2012 study in the Quarterly Journal of Economics attributes much of the 26% decline in business investment in the 1937-38 recession to higher taxes on capital. Hillary Clinton’s fix for an economy suffering under 2% growth is resuscitating a tax scheme with a history of ushering in recessions. The economy would be better off if the idea remained buried. Maybe we should ask the same policy about her that we asked about FDR: Is she misguided or malicious? P.S. Some folks may argue that Hillary has more leeway than governors to impose class-warfare tax policy because it’s harder to emigrate from America than it is to move across state borders. The United States has odious exit taxes that restrict freedom of movement. And even though record numbers of Americans already have given up their passports, it’s still a tiny share of the population. Likewise, not that many rich Americans have taken advantage of Puerto Rico’s status as a completely legal tax haven. But while it’s true that it’s not easy for an American to escape the jurisdiction of the IRS, that doesn’t mean they’re helpless. There are very simple steps that almost all rich people can take to dramatically lower their tax liabilities. So Hillary and the rest of the class-warfare crowd should think twice before repeating FDR’s horrible tax mistakes. I live in Texas and see this as a great problem for our state. The problem is that though they run away from high taxes, they do not run away from their voting habits. SO, they come here, and start saying things like “why wouldn’t I vote democrat-? It’s how I’ve always voted.” Better t-off those types stay right where they are. Austin is already overrun with them, and is the most populous liberal enclave east of Boulder, Colorado. “Pretty” states, like California, states with large endowments of geographical and climatic fortune, have a more accelerated Laffer curve. The peak occurs earlier. That is because in these states, the greater availability of non-pecuniary rewards (surfing, being a bum in Santa Cruz etc.) decrease the relative value proposition of work. If states with less favorable geography (eg. Texas) were to implement California policies, they’d end up in the ditch in no time. Is she misguided or malicious? Probably neither. But it doesn’t matter either. Because voter-lemmings want to hear (and vote) these narratives. So they will ferret out those few people who not only are competent at selling these stories, but also believe in them. It happens organically in the free market for votes. In other words, if voters around you are lemmings there’s little hope. You either get out, or head for the cliff. We moved to FL 4 years ago because of the tax (or lack thereof) benefits.